Kenmare News | Kenmare author tackles Timmy’s Technology Trouble! 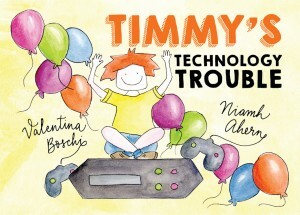 Kenmare author, Niamh Ahern, is tackling one of the biggest problems of our time through her new book ‘Timmy’s Technology Trouble’. Niamh’s excellent book, which will appeal to children from 4 to 8 years of age, shows how a happy, well balanced, outgoing, fun loving little boy changes when he get a games console for his birthday. His parents don’t manage his use of the console and we see a total deterioration in his behaviour, as he becomes addicted. But then a storm knocks out the power in his house with surprising results! The book has been illustrated locally by Valentina Boschi an Italian artist, who now lives in Kenmare with her husband and two children, and has been published through Dennison Design. The book has received plaudits from experts and rugby stars alike. “Timmy’s Technology Trouble is an exceptional, necessary and must-read book. Addressing key issues parents and children face when navigating the world of technology, it does so in a non-judgemental, proactive and fun way. “Timmy’s Technology Trouble is a beautiful book with a powerful message that every parent will appreciate. Author Niamh Ahern grew up in Clonakilty and now lives in Kenmare with her husband, two children and two crazy dogs. Having studied Economics and Computer Studies in UCC and worked as a Project Manager, she parked her career to become a stay at home Mum and recognises the challenges for parents in managing children’s technology time in this rapidly moving Digital era. She has always dreamt of writing a children’s book and is passionate about children’s literature. This is her first book and has been a project of complete love and fun. Timmy’s Technology Trouble will be launched in the Carnegie Arts Centre in Kenmare on October 19th at 8pm. All welcome!